Easter Vigil, dating back to at least the Roman times, takes place on Holy Saturday. The Easter Vigil is a service held in many Christian churches as the official celebration of the Resurrection of Jesus Christ. The service includes the first use of the word alleluia since the beginning of Lent as well as the first Eucharist of Easter. The Easter Vigil is celebrated by the use of a wax candle which is inscribed with a cross. The letters alpha and omega are inscribed at the top and bottom and the four numbers representing the current year are inscribed above and below the cross arms. Five grains representing the wounds of Christ are sometimes pushed into the soft wax. In the early church this was always the time to baptise or 'christen' new Christian converts who had be learning about Christianity during Lent. They were then ready to take their first communion on Easter Sunday, the day of Resurrection. Christian baptisms symbolise death and resurrection and so it is very fitting for them to take place at this time of year. The Bacup Nutters Dance traditionally takes place on this day in the small Pennine town of Bacup. Each year a team of folk-dancers with blackened faces dance through the town from boundary to boundary. 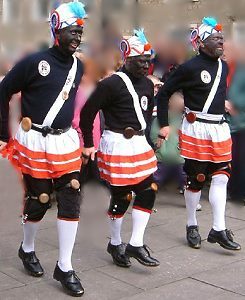 A form of morris dancing, the blackened faces could be down to the mining connection or it may be to protect the dancers from being recognised by evil spirits. The tradition of this dance is thought to date back to 1857. It is said to have originated with Moorish pirates, and to have been brought to Lancashire by Cornish tin miners.